Lake Echo, Maine. A rustic cabin in the woods surrounded by crystal clear water, old pines, silver birches, and amazingly warm friends. This was the place I dove head first in to a soul-enriching vacation, and went on a quest to find giant Maine lobsters to dip in lemon butter, toss in mayo, or stuff in to every type of bread imaginable. Lobsters are at the heart of every food decision during the summer in Maine. 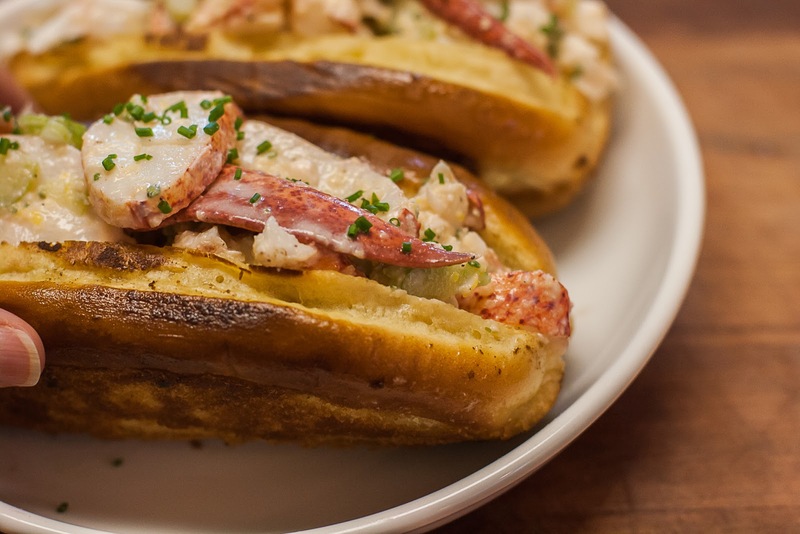 Most menus feature some sort of lobster dish, preferably the chef’s take on the infamous lobster roll. As I watched my friends boil giant lobsters, toss pasta with freshly picked meat, and order lobster paninis that were lightly doused with lemon and pressed, I observed what they enjoyed the most so I could mimic our Maine experience at home. Mind you, I am not a New Englander, so I would never suggest I have perfected the lobster roll. 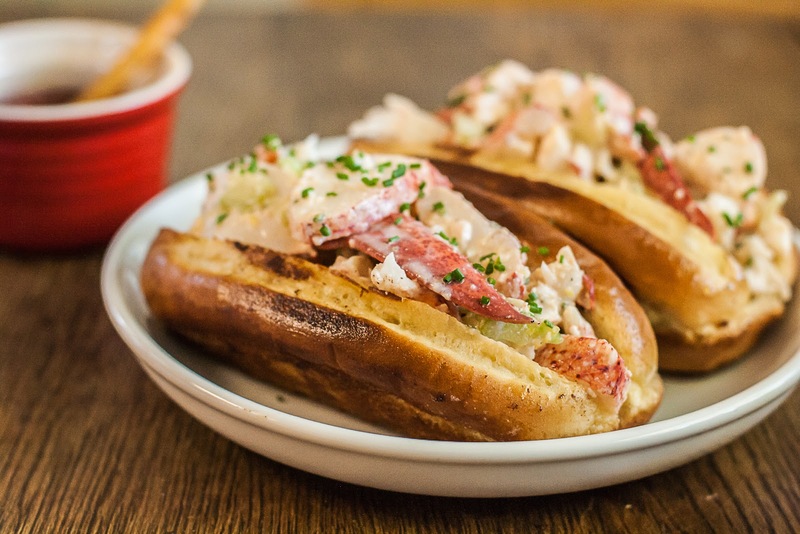 Lobster rolls are like a religion, and I would never win that debate. 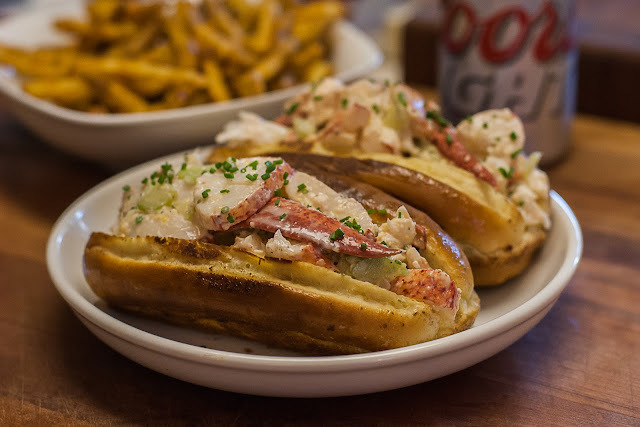 What I have done is taken my years of lobster roll voyeurism, wrapped it up in to an easily accessible package, and I am handing it to you on a butter covered platter. What it comes down to, what matters most, is simplicity. It is all about the lobster. The bread must be soft, buttered and toasted. The lobster must be handpicked and only lightly seasoned. The reason butter, lemon, and mayonnaise are typically paired with lobster is because all of them highlight the sweetness of the meat. To make a worthy lobster roll, it is very important to keep it simple, pile it high, and use sweeter softer bread as a lobster delivery device. This recipe takes all of that in to consideration, and eating one outside with a cold beer surrounded by good friends will make it taste that much better. Cook live lobsters at home, or buy freshly picked meat at your local fish monger. I went to Maine for my lobsters, and kept them alive for their adventure to Baltimore in a cooler that was carefully packed with salt water soaked newspaper and cold ice packs. This environment allows them to breathe and keeps them alive for about 24 hours. Then we boiled them in salted water (as salty as the sea) with chunks of lemon and bay leaves. In my opinion, boiling lobsters in flavorful water is the easiest way to impart flavor and cook them evenly. It’s also the most humane (quick death vs. slow). But you can also roast, grill, or steam them. Whichever method you prefer, cook them for about 6 -7 minutes per pound until they are bright red, and then throw them in icy water to stop the cooking process. The general rule of thumb is 15 minutes per 1 ½ pound lobster, but I have found that to be about 1 minute too long. I like my lobster succulent, not tough! 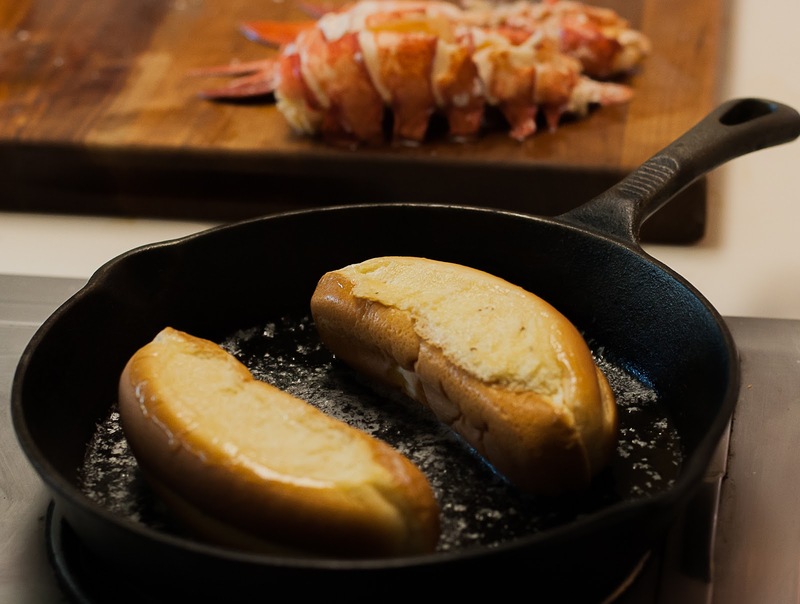 In a cast iron skillet on medium low heat, melt 2 tablespoons of butter. Top-split buns have wider sides providing a larger surface area for browning in butter. The key is to do this low and slow. Brown each side of the bun in the butter; about 3 minutes per side. While the buns are toasting, in a small microwave safe bowl, melt 3 tablespoons of butter. In large bowl, combine mayonnaise, melted butter, lemon juice, celery, chives, and salt and pepper to taste (create the dressing first without adding the lobster so you can season according to taste). This creates a light yet rich dressing for the lobster. Gently toss the chunks of handpicked lobster in the dressing. 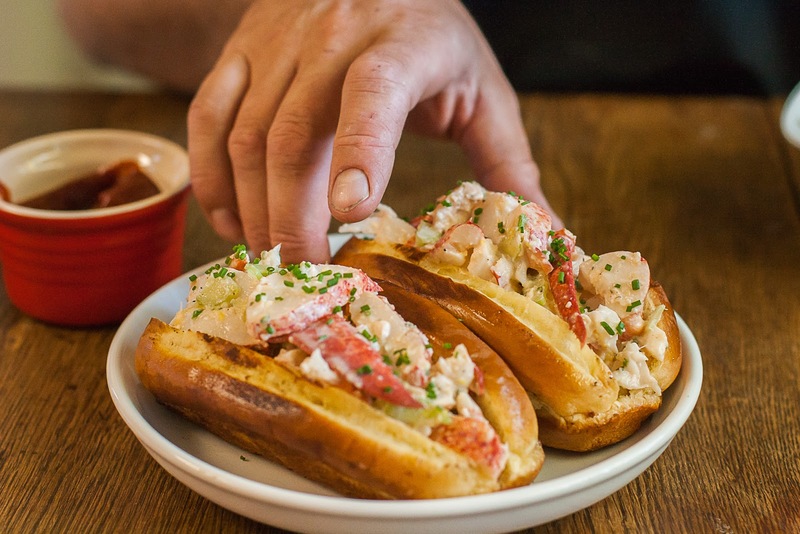 Load each hot buttered bun with ¼ of the lobster salad, liberally stuffing the bun and piling it high. Top with a sprinkling of chives. Scarf down immediately with a cold beer, pickles and chips. Hi Kimmi! What a luxurious roll with lobster! We hardly can find fresh lobsters in our local market here... I suppose frozen ones are decent substitutes? Flash frozen lobsters are certainly a perfect substitute! Beautiful! I've actually never had a lobster roll, despite spending a week almost every summer in Kennebunkport, visiting my grandmother. Wow! This brings back great memories of a holiday in Maine some years ago. Delicious! Love that you have pan-toasted the rolls first. I will probably have to wait til I am back in Maine to make this dish tho. My local fishmonger had a special offer on lobster the other day. Two teeny weeny creatures, hardly bigger than a prawn, for 30 euro - ouch! OMG! This is one of my most favorite sandwiches EVER. Recently I found this shop where they cook lobster for us. All I have to do is to remove the meat. So easy! I've been trying to go to that store to get some lobsters and your recipe came just in time!!! I'm going to dream about this tonight. :) Big drool going on. Pinning!